In the UK since 2012, Ceva has supported the annual Awards for Animal Welfare which recognise and reward volunteers, charity workers, veterinary professionals and children who have demonstrated outstanding commitment to supporting and improving animal welfare globally. Often cat welfare comes second to dog welfare. In the US, 64% of cats versus 86% of dogs enjoy regular veterinary care, and in the UK it’s even worse: just 25-30% of cars are treated regularly. So, for more than 10 years, Ceva has partnered with two leading cat organisations – International Cat Care and the American Association of Feline Practitioners (AAFP) - to improve the health and wellbeing of cats, including those with no owners, throughout the world. This includes reaching out to both owners and vets - to enable a better understanding of cat behaviour and to improve cats’ welfare in the home and the clinic. Ceva also supports the continuing education of professionals through congresses and the development of specialised technical information about cats. Our partnership is already yielding results. In Australia and New Zealand, we’re working with the veterinary division of the International Society of Feline Medicine to promote cat-friendly clinics – the programme is a big success. Things are looking up for the cats of the world. Ceva is proud to support both ARDRA, an organisation that provides riding opportunities for people with disabilities, as well as inspirational elite para-dressage competitors and their horses. Ceva has a partnership agreement in equine therapy with ARDRA. 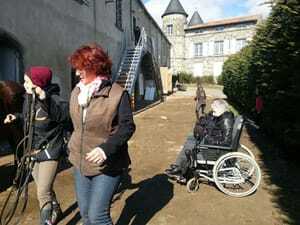 ARDRA offers a programme of equine assisted therapy for groups of people suffering from multiple sclerosis. The programme aims to give patients with multiple sclerosis the opportunity to practice recreational horseback riding and help them understand their illness better, accept it and live with it. This has been designed by Dr. Didier Vernay, a neurologist in Clermont-Ferrand, and Cécile Cardon, an equine psychotherapist. Ceva also partners with highly successful riders, such as para-dressage competitor Valérie Salles, as well as providing veterinary support for their horses.